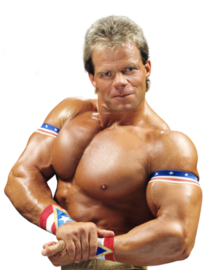 Lex Luger is a retired professional wrestler. His career transitioned from professional football to Championship Wrestling in 1985. He was United States Heavyweight Champion from 1989-1990, World Heavyweight Champion from 1991-1992, joined the WWF from 1993-1995, and then returned to the WCW in 1995.